Chongqing hot and sour noodle soup is one of the world favourite Chinese noodles, popular not only in Chongqing but also in Sichuan. I love it, it's spicy, salty, sour, garlicy and the noodles are soft and slippery. A bowl of red hot slurping goodness. This noodle soup can be a fast food, can prepare in minutes if all the components/ingredients are prepared in advance. Make soup base with pork bones or chicken bones. Boil bones with few slices of ginger and one/two stalks of spring onion. Do not add salt. Have the soup base heated to boiling before serving. Heat oil add garlic. Stir fry till fragrant. Add chilli bean sauce, stir till oil is turning red. Add pork stir fry till pork is brown and any liquid is drying up. Add soy and sugar to taste. Can use bought or homemade chilli oil. Chilli oil is very easy to make at home and taste far better than bought. This is a recipe posted previously. And here is another simple way to make some. *level of spiciness depends of type of chilli powder used. Redder the powder redder the oil made. Rinse Sichuan peppercorns and drain. (wetting the peppercorns help to release the flavour easier and delay burning in hot oil). 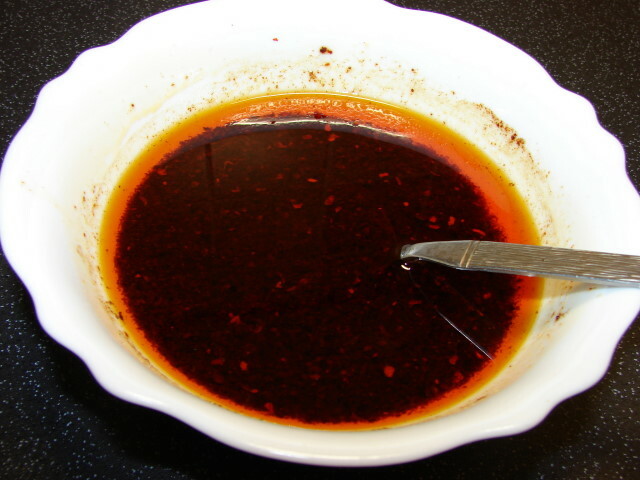 Mix chilli powder with vinegar in a medium size soup bowl. Heat oil till warm. Add peppercorns. The oil will gradually get hot and sizzle due to the moisture in peppercorns. Fry peppercorns till oil is fragrant and peppercorns are turning brown. 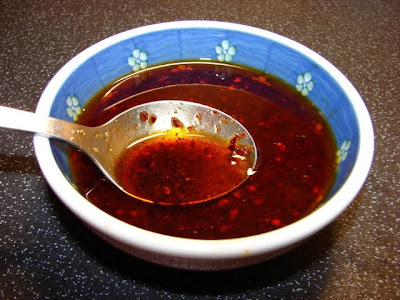 Pour oil through a metal sieve directly into chilli paste. The oil will boil rapidly hitting the chilli paste with lots of bubbles. Stir and leave to cool. Mix together 3 tbsp chilli oil with chilli solid, 1 tbsp roasted sesame oil, 3 tbsp Chinkiang black rice vinegar, 1 - 2 tbsp light soy, 1 tsp salt or Chicken bullion powder, 1/2 tsp ground Sichuan pepper, 1/2 tsp ground pepper, 2 - 3 tsp sugar. Soak some soy beans overnight. Drain. Rub dry with clean tea towel. Deep fried at medium heat till golden brown. Remove and leave to cool. Dry roast peanuts with skin using a dry pan or wok. Stir continuously for about 8 - 10 minutes till peanut is medium golden brown. Remove and spread out to cool. Put peanuts in a colander, rub peanuts with hand and/or against the colander to remove skin, the skin will fall out of the colander. Best do this in the sink or outdoor to prevent mess. You can also use bought roasted peanuts. *Crunchy soy beans are the traditional condiments used. I am not too keen with them so I used peanuts. 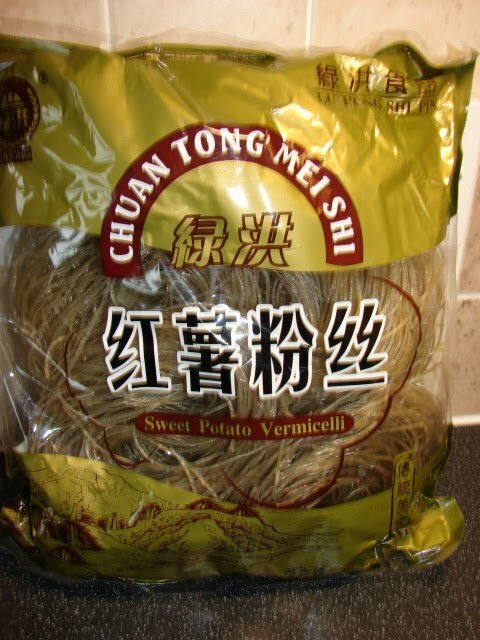 Use sweet potato noodles/vermicelli where possible. 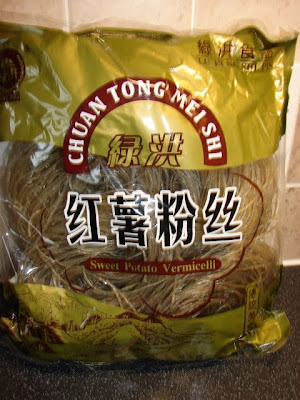 If you can't find sweet potato noodles use thick mung bean noodles or rice noodles. Here is one I used. Soak the noodles for about 30 minutes or till softened. Cook with rapidly boiling water briefly till soft. Cook noodles just before serving. Add few tbsp of spicy sauce, much as you like. Taste before adding too much, or it can be too salty and spicy. 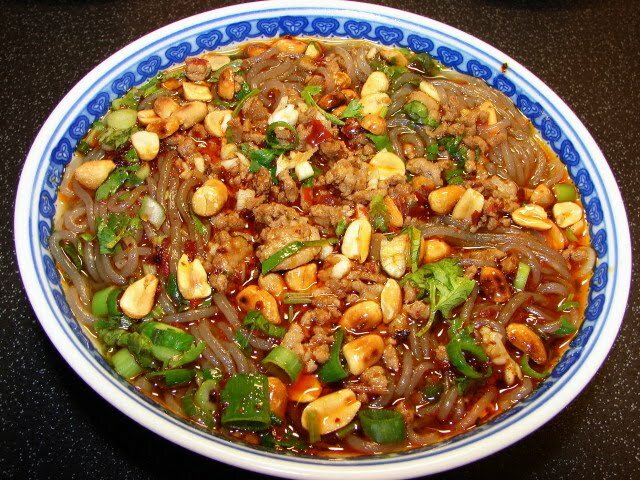 Here is another version Hot & Sour noodles Hunan style. In Pixian douban jiang, is Pixian the brand of the sauce? Pixian is a town in Sichaun famous for producing the best Sichuanese chilli bean sauce. There are many manufacturers or brands of Pixian chilli bean sauce, but if it is Pixian it's usually better than any sauce produced elsewhere. Thank you so much for posting these recipes. I live in Hong Kong and love the local and mainland food so much. I have been looking everywhere for Chinese recipes but I kept getting turned off by how westernized they seemed (spaghetti in dan dan mian but no peppercorns). Aside from my Cantonese neighbor you are my favorite recipe source.